Navy Master at Arms Second Class (EXW) Sean Edward Brazas, a native of Greensboro, NC made the ultimate sacrifice on May 30th, 2012 in Panjwa'l, Afghanistan, while helping assist a service member during combat operations. Sean Brazas enlisted in the Navy in 2006. Sean told his family that he joined the Navy because he wanted to do something meaningful in his life and that he wanted to protect his family. In Sean's time in the Navy, he was stationed at Naval Bases at Crete, Guam, and Washington State. Sean was a specialist with boats as a Coxswain where he was trained in Norfolk, Va, and advanced weaponry. 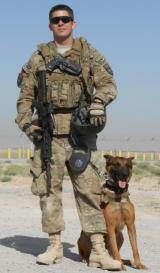 He decided to change his focus and specialize working as a Navy Military Working Dog Handler within Security Forces. Sean always had an affinity for dogs and he progressed through multiple vigorous trainings in order to become a MWD Handler. Sean began his MWD training at Lackland Air Force Base in San Antonio, Texas. While there he received the highest score in his class. Another notable training Sean went through was an Inter-Service Advance Skills K9 course run by Marines in Yuma, Arizona. Sean completed this training the month prior to deploying. Sean and his dog Sicaro received the "Top Dog Award" for their excellence exhibited in training. Sean deployed to Panjwa'l, Afghanistan on April 30th, 2012, as an IA, individual augmentee, and joined up with Army forces to work with them on combat operations. One of his central tasks were to locate IED's while on mission. On May 30th, 2012 Sean and his fellow servicemen were ambushed. Sean was helping a fellow comrade into a helicopter when he was fatally shot. Sean was an honorable, passionate, joyful, hard-working man who made the ultimate sacrifice in order to protect his family, fellow Americans, and our freedoms that he so deeply believed in. Sean was laid to rest in Arlington National Cemetery on June 19th, 2012. He was buried with full military honors. Some of his honors include: Purple Heart, Army Commendation Medal, Afghanistan Campaign Medal, Combat Action Ribbon. Sean's life and sacrifice has greatly impacted the community. Sean graduated from Western Guilford High School in 2004. This fall the WG Soccer Team that he once played for held a game in his honor. Many people from the community gathered to celebrate Sean's life and accomplishments. Donations were gathered for The Wounded Warrior Project and Western Guilford High School is currently working on setting up a scholarship in Sean's name. Sean's impact on the community does not stop there. At Naval Base Kitsap in Seattle, WA his wife, Allie, has organized an annual Brazas Bowl to honor Sean. In Guam where Sean served, his fellow sailors have adopted a kennel at the local animal shelter in Sean's name. The sailors he worked with in Greece are currently creating a permanent web domain to tell Sean's story and celebrate his life. MA2 Sean Edward Brazas is an American Hero and inspiration to so many people. He is remembered not only for his heroism, but also for his uplifting spirit and smile that he exhibited every day of his life. Written by his sister, Kelly Nance.